Rio Grande’s Chelsy Slone drives past Indiana East’s Bailey Dreiman during Tuesday night’s game at the Newt Oliver Arena. Slone finished with 17 points, but the RedStorm suffered an 84-78 loss to the Red Wolves. 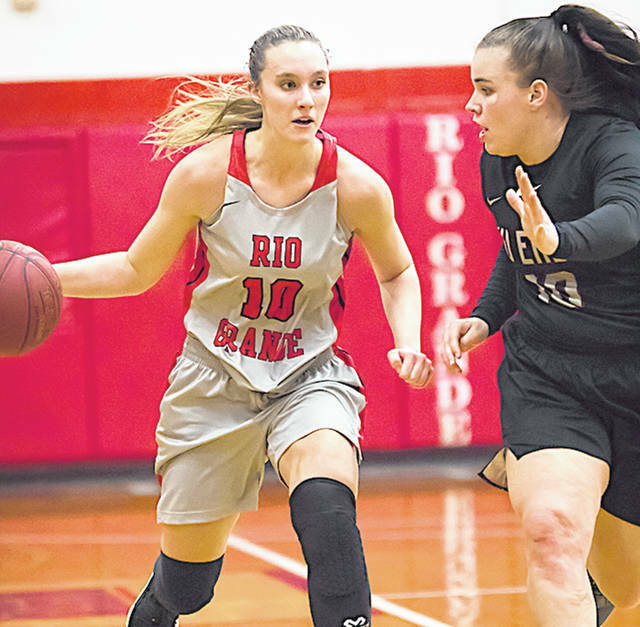 RIO GRANDE, Ohio — For the second time in three games, it was a third quarter swoon which spelled doom for the University of Rio Grande women’s basketball team. Indiana University East used a 15-0 run over a span of five minutes to take control and then held on down the stretch for an 84-78 win over the RedStorm, Tuesday night, in River States Conference women’s basketball action at the Newt Oliver Arena. The Red Wolves improved to 11-14 overall and 9-4 in conference play, completing a regular season sweep of Rio Grande in the process. The RedStorm lost for the seventh straight time, falling to 13-12 overall and 4-9 in the RSC. Rio Grande trailed by as many as eight points in the first half before forging a 44-all tie at the intermission and taking a 46-44 advantage after a jumper by senior Chelsy Slone (Gallipolis, OH) just 11 seconds into the third period. But by the time the RedStorm scored again – on a bucket by senior Jaida Carter (New Philadelphia, OH) with 4:31 left in the quarter – IU East had turned the two-point deficit into a 13-point lead. The Red Wolves twice pushed their lead to as many as 16 points in the fourth quarter, but Rio Grande refused to go away quietly and pulled within eight, 76-68, on a bucket by Stone with 2:23 left to play. The RedStorm sliced the deficit to five, 83-78, after a pair of free throws by junior Megan Duduit (Minford, OH) with 5.2 seconds remaining, but ran out of time in its effort to complete the comeback. Rio Grande shot just 25 percent from the field (10-for-40) in the second half after connecting at a 53.1 percent rate (17-for-32) in the opening two quarters. Carter finished with 24 points – 22 of which she scored in the first half – to go along with a eight rebounds, a team-high five assists and a team-high four steals. Slone totaled 17 points, including 13 in the final period, while sophomore Jimi Howell (Barberton, OH) pulled down 10 rebounds. Addie Brown led a quartet of double-digit scorers for IU East with a game-high 25 points, while Elizabeth Philpot finished with 16 points and 10 rebounds. Libby Springmeier and Faith Sanderson added 14 and 10 points, respectively, while Amanda Worland had a game-best 11 rebounds, five assists and four blocked shots and Bailey Dreiman totaled four steals. The Red Wolves shot 50 percent in the second half (13-for-26) in the second half and enjoyed a 45-42 rebounding edge. Rio Grande will return to action on Saturday when it visits Ohio Christian University. Tipoff is set for 1 p.m. at the Maxwell Center in Circleville.